FILE PHOTO: The Cedar River flows beyond its banks along Otis Road SW on Aug. 27, 2007. 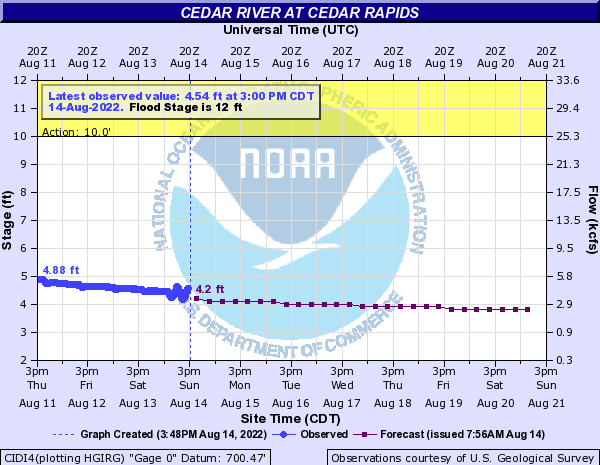 The flood warning for the Cedar River at Cedar Rapids continues, with the National Weather Service expecting a crest of 18.3 feet tonight. The flood stage was 18.1 feet at 9:45 a.m. today. • Cheyenne Dog Park closed — The Cheyenne Park Off-Leash Area at 1650 Cedar Bend Lane SW is closed due to rising water on the Cedar River. Park visitors are asked to watch for notification before using it again, since flooding in previous years left debris and damage that made the park unsafe until it could be cleaned and repaired. • Sac & Fox Trail from Cole St. to Rosedale Ct.